Earlier this year, Germ, the user behind MagicianMew, sent me an e-mail asking if I would be interested in reviewing a new deck they were creating. Describing it as a minimalist deck with keywords on each card for easy reading, they called it The Apprentice Tarot. The goal was to create a deck where experienced readers and beginners alike could seamlessly read without utilizing a booklet. I was intrigued and couldn't wait to get a copy! And I have to say, I wasn't disappointed. The Apprentice Tarot features pastel watercolor backgrounds with element highlights, giving it a light and airy presence for the reader. The individual cards themselves are bigger than a standard playing card but not as large as I've seen some decks, making it easier to hold and shuffle. A huge plus! 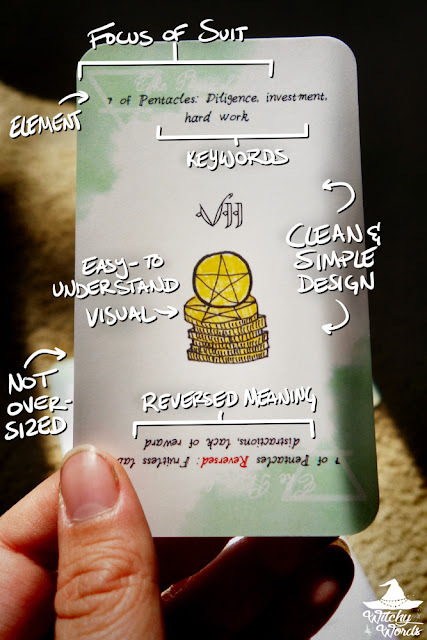 Each card face includes keywords that define both the upright and reversed meanings and a simple and easy-to-remember design that helps highlight those meaning. Suits in the Minor Arcana are color-coded, with elemental correspondence and a keyword linking to that particular suit on the corners. The Major Arcana features all of the colors in its background with an eternity symbol at the corners. Germ said that the deck was "less of a personal vision and more something [created] to serve the individual reader." Before publishing it, they wanted to do a small personally-funded run to see what beginner and experienced readers thought, which is how this deck ended up in my hands prior to a Kickstarter campaign. I have a deep respect for creators who want to make sure their product works and correct any issues before moving forward. While reading, I noticed a few minor errors that have already been corrected, many having to do with the original printer Germ used. Now that they've swapped printers, the colors are more vibrant and the mistakes in printing have been corrected. During a Drunk Divination, I passed it around my circlemates to see what they thought. One of them suggested that the only thing the deck was missing was a single card with some suggested spreads. For those just learning tarot, this could enhance their experience. I was very pleased with this deck. As an experienced diviner, it read very well. As someone who doesn't use tarot, it was easy and simple to follow. The straightforward descriptions make it so much easier to connect to the cards. Exhaustive paragraphs of description make it far too complicated, particularly when you're just starting out. This easy-to-understand format works well with creative, minimalist designs and a clean interface. Overall, I absolutely loved The Apprentice Tarot and would highly recommend it. Right now, Germ is preparing a Kickstarter campaign for the deck but, until that is arranged, go check them out on Ko-fi and give them a boost! Any proceeds that don't help with a personal vet bill will go straight to producing this deck! Support MagicianMew and The Apprentice Tarot here.